What curriculum do Key Stage 4 students experience? Our commitment to a broad and balanced curriculum continues into Years 10 and 11. Students have the opportunity, however, to optimise their talents and select courses that reflect their specialisms and interests. During Year 9 we work with parents and students to select a personalised programme for each student in Years 10 and 11. We regard this process as very important as students respond well to a more individualized, challenging and engaging curriculum that enables them to achieve of their best. For more details on the Key Stage 4 course choice process click here to take you to the section on How do we provide students with information, advice and guidance about course choices and careers? As a ‘high performing school’ we gained a second specialism in ‘applied learning’ from September 2009. Aimed across the age and ability range the greatest impact has been at Key Stage 4 offering additional courses to students. The majority of the courses lead to public examinations, mostly at GCSE level. A few may be certificated by the examination boards for shorter modules of work. 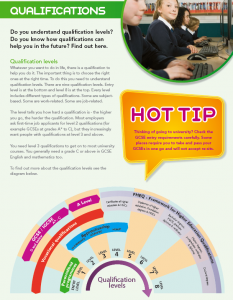 Parents may be interested in clicking on the following image for more details on the different types of qualification that students can take and the “levels” that they operate at. Full details of the curriculum are provided in the ‘Year 10 courses booklet’ (click here to download the current edition), which is made available in the Spring Term. The number of GCSE subjects taken varies from one student to another although the majority currently take 9 full GCSEs. All our courses in Key Stage 4 are grouped under Curriculum Organisers. The link of the courses between these Organisers, the Core Courses all students have to study at Key Stage 4 and the Individual Programme Courses is shown below. Through our membership of the Cheshire East 14-19 Partnership North we are also able to offer a range of more specialised and personalised programmes to individual students. All students develop an understanding of the work related curriculum in areas of the curriculum and during work experience over a week in the summer term in Year 10. Increasingly students are involved in business enterprise activities through both the PHSCE and Xtra Programmes. For students in Key Stage 4 the Curriculum Digests take on a different name and format. Introduction to the course – what examination specification will be followed? Course description – what knowledge and skills will students be learning? Assessment – what tasks will the students have to do to achieve the qualification? Homework – what commitment will students have to make outside of lessons? What websites do we recommend?